Since 1882, Maison P. Ferraud & Fils is located in the magnificent Beaujolais’ terroir at Belleville Sur Saône. Over the centuries, several domains and exclusive partnerships came to reinforce the love for this terroir. Thanks to its rich soil such as clay-limestone, granite sandstone, granite, the Beaujolais area gives a beautiful variety of wine. The Gamay Noir variety reigns supreme. 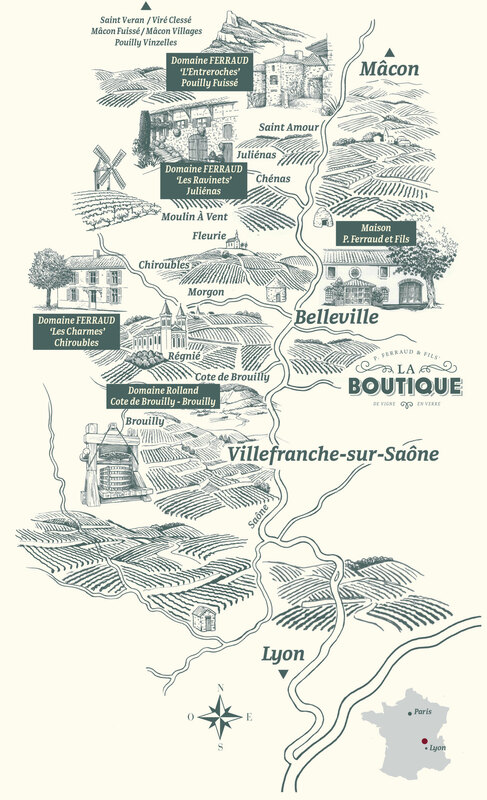 This beautiful terroir offers aromatic and fruity wines such as Beaujolais and Beaujolais Villages but also more complex and rich wines with the ten Beaujolais crus : Brouilly, Chiroubles, Chénas, Côte de Brouilly, Fleurie, Juliénas, Morgon, Moulin-à-Vent, Régnié, Saint Amour. Maison P. Ferraud & Fils is also flirting with the Mâconnais terroir, because of its geographical location and its family history. The white wines made from the Chardonnay grape such as : Mâcon Fuissé, Mâcon Villages, Pouilly Fuissé, Pouilly Vinzelles, Viré Clessé and Saint Véran. We do appreciate its freshness and its minerality.